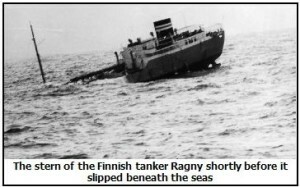 GEORGETOWN – Late on the night of December 26, 1970, in stormy seas 600 miles off Cape May, New Jersey, the aging 540-foot Finnish tanker Ragny broke in half without warning. An SOS went out and was relayed to the Coast Guard station in New York which immediately initiated rescue operations. Thirty-one crewmembers were stranded on the stern section and six, including the captain, were believed to be on the bow. The Coast Guard cutter Escanada, on its way to Atlantic station Echo and 170 miles away, was immediately diverted to assist in the rescue. After 20 hours traveling at full speed, the Escanada reached the stricken tanker in the middle of the following night. Another vessel, the SS Platte, had reached the Ragny earlier but had already lost a crewman when a rescue lifeboat capsized in the rough seas. The Escanada established communications with the stern’s survivors by sending them a portable radio by shotline. The cutter’s commanding officer then made the decision to wait until first light to attempt any further rescue efforts for obvious safety reasons. But several hours later the Ragny crew reported that the stern was sinking and the commanding officer of the Escanada ordered a dangerous nighttime rescue. Two lifeboats were lowered from the cutter into 10-15 foot seas and, with great risk, successfully rescued all 31 crew from the stern. The bow of the Ragny, unfortunately, disappeared from the radar screen just after the stern rescue was completed. Throughout the following day, the Escanada continued to search for the captain and five missing crewmembers from the bow, but they were never found. Terrance P. Hart was born in 1948 in Chicago, the son of a career Coast Guardsman. As part of a military family, Terry traveled throughout the country while growing up but eventually would spend the last two years of his secondary education at Mt. Diablo High School in Concord, Calif. During his senior year he was student body president and participated on the cross-country and track teams. Always knowing he was destined for a military career, he applied to and was accepted at both the Coast Guard Academy and Annapolis. He chose the Coast Guard, mostly because of his father, but also because he was excited about sailing on the Coast Guard’s tallship, the Eagle. He would subsequently spend three summers hauling lines, climbing masts and furling sails on the Eagle. Hart says that the first thing a cadet is required to do is climb a mast – to overcome any fear of heights. Terry graduated from the Coast Guard Academy in 1970 – only a third of the entering class made it to graduation that year – and was assigned to the Cutter Escanada as an Assistant Gunnery Officer and Deck Watch Officer. The 255-foot Escanada was an ocean station vessel which would travel out to a specific point in the Atlantic and stay on watch for 30 days, collecting weather information, providing navigation assistance to aircraft, and monitoring radio traffic. Terry spent two years on the Escanada where he would participate in a number of rescues, recoveries and the towing of disabled fishing boats. However, he was also fortunate to participate in the exciting America’s Cup races off Newport, R.I. in 1970 where the Intrepid defeated the Australian challenger, Gretel II. In 1972, after being promoted to lieutenant junior grade, Terry Hart became the commanding officer of the 95-foot Cutter Cape Horn out of Woods Hole, Mass. He will never forget his first tow job. It was the carcass of a huge 65-foot humpback whale which had washed up on the beach at Provincetown. Most of the time, however, the cutter performed search and rescue operations around Cape Cod and out to George’s Bank. Two years later Terry was transferred to the Coast Guard District in New Orleans as a controller in the rescue center. This station was responsible for all air and sea, search and rescue operations in the entire Gulf of Mexico. The controller coordinates all operations much like an air traffic controller at an airport. The shifts were 24 hours on and 48 hours off, but that was only if you were lucky. It was here that Terry became an expert on hurricanes and was preparing for the worst when one headed directly towards New Orleans – but then took a left turn at the last moment. In 1974 Terry volunteered to become Commanding Officer of the Cutter Flagstaff, an experimental hydrofoil formerly belonging to the Navy. This was an era when Washington was beginning to emphasize drug enforcement and the 50+ knot Flagstaff was thought to be ideal for interdiction of drug smugglers. Although stationed out of Woods Hole, Hart says the cutter spent much of its time up in Boston for repairs. Because of the continuing maintenance problems, the Flagstaff was decommissioned after two years of trials. Hart still remembers the thrill – and awe from the bystanders on shore – going through the Cape Cod Canal at 50 knots without creating a wake. In late 1978 Terry Hart was transferred to Coast Guard Headquarters in Washington, D.C. in the military readiness division. 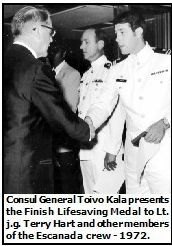 He would subsequently become the Current Operations Officer for all international law enforcement activities involving the Coast Guard. During his tenure he would be involved in 480 drug-bust cases, all involving foreign boat seizures. In 1980, Cuba’s Fidel Castro emptied his prisons and told them and other “government-designated undesirables” that they could flee to the United States if they wished. This became known as the Mariel Boatlift and involved over a thousand boats and rafts headed for U.S. shores. President Jimmy Carter, alarmed at the huge influx of Cubans, ordered a stop to it. Coast Guard Headquarters sent Terry Hart to Miami to set up the law enforcement and engagement procedures. The program worked. Within two weeks, the number of Cubans fleeing to the U.S. had dwindled to just a trickle. In the summer of 1983, drug problems were sweeping the country. President Ronald Reagan decided he needed a “Drug Czar” and appointed his vice president, George H.W. Bush, to that position. Shortly afterwards, Terry Hart got a call from the White House to join the Bush team. He was assigned to the staff of the National Narcotics Border Interdiction System. He ended up spending three years with Bush fighting the war on drugs. By now Terry Hart had been away from sea duty for seven and a half years. The Coast Guard had a stipulation that after seven years away from a sea command, you are no longer permitted to return to the sea. So Terry was relegated to shore duty from here on. In 1986 he asked for and was appointed Chief Law Enforcement & Intelligence Officer for the First Coast Guard District in Boston. (The district encompassed all waters from Toms River, N.J. to the Maine/Canada Border.) Four years later he became Deputy Group Commander of Coast Guard units performing law enforcement, aids to navigation and search and rescue operations from the Cape Cod Canal to the New Hampshire border. In 1992 Terry was the Coast Guard’s “logistics coordinator” for Sail Boston ’92, the international parade of tall ships through Boston Harbor. This was also the year that Terry was promoted to captain and became Director of the Coast Guard Auxiliary for all of New England. After a short stint as Chief of Boating Safety, in 1994 Terry Hart was transferred to what was to become his last station – San Francisco. He was the Coast Guard’s Group Commander of search and rescue, aids to navigation and law enforcement for most of the northern California coast as well as inland to Lake Tahoe. In 1997, Terry retired after 27 years in the Coast Guard. His military awards include the Legion of Merit, the Meritorious Service Medal, six Coast Guard Commendation Medals, and the Life Saving Medal from Finland. Terry is a life member of the Disabled American Veterans and the Military Officers Association, and a member of American Legion Post 104 in Hamilton. While Terry was at the Coast Guard Academy, he met a young nursing student by the name of Barbara Haneberg. He married her in 1970, in a ceremony just three hours after he graduated from the academy. Terry and Barbara have three children: Kari (Richards), John and Kevin; and five grandchildren. Only John acquired a taste for the sea; he is a merchant mariner currently aboard the USS Mercy hospital ship. After he retired, Terry Hart eventually decided he wanted to help other veterans. 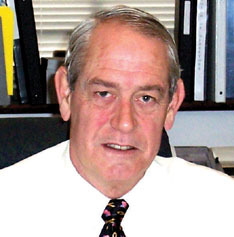 In 1999 he became Director of Veterans’ Services for the towns of Georgetown, Essex, Hamilton, Ipswich, Rowley, Wenham and West Newbury. Terry says the job doesn’t pay as much as some of his command posts, but the satisfaction of helping others more than makes up for the difference. Terry Hart, we thank you for your service to our country. A true Patriot, a good and decent human being. Rest in Peace, Terry….